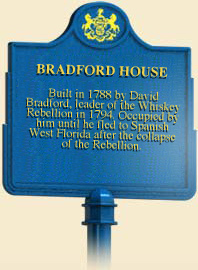 If one man could claim to be the "leader" of the Whiskey Rebellion, it was David Bradford. Within a week of the sacking of federal tax collector John Neville's home at Bower Hill,Bradford emerged as the protestors' spokesman, leading tax protest meetings at the Mingo Creek Church on July 23, at Braddock's Field near Pittsburgh on July 28, and at the Bonnet Tavern near Bedford in early August, where the more radical insurgents repudiated Albert Gallatin and Hugh Henry Brackenridge's calls for non-violent protest and resolved to resist any armed force sent to enforce the excise tax. Most early histories of the Whiskey Rebellion characterized the rebels as an unruly mob that had little, if any, respect for private property or law and order. Written in early 1800s by Federalist sympathizers, they echoed the sentiments of the nation's Federalist political leaders, who depicted the rebels as people of no significance in order to minimize the justice of their cause. The rebellion, however, was not so simple to explain. Four colonels of the Washington county militia were among those arrested as principal rebels, as was respected Baptist minister John Corbley. And Bradford was a leading lawyer and the county's deputy attorney general. The David Bradford house, as it appeared circa 1930. Like nearly every adult resident in western Pennsylvania in the early national period, Bradford was a newcomer to the region. Born in Maryland sometime around 1760, he had immigrated to Pennsylvania and been admitted to the Washington County bar in 1782. Serving as deputy attorney general for the county since 1783, Bradford was an extremely successful lawyer and businessman. His residence, completed in 1788, reflected his high social standing in the Washington community. The sizeable stone exterior enclosed a magnificent interior, highlighted by a grand mahogany staircase and wooden paneling transported across the Alleghenies from the east at great expense. Bradford had no coherent plan to offer the Whiskey rebels in 1794, but his verbal assaults against the federal government convinced the rebels to elect him their leader. Inflamed by his anti-Federalist rhetoric, they vowed death to revenue collectors and secession from the Union if President Washington tried to enforce the excise tax. When Bradford learned, on August 6, that federal authorities were planning a large-scale invasion, he stood firm. "We have fully deliberated," he wrote to his lieutenants, "and have determined with head, heart, hand and voice that we will support the opposition to the excise law. The crisis is now come: submission or opposition." In mid-August, Governor Thomas Mifflin and President Washington appointed a joint peace commission to make a final effort to end the conflict without a military invasion. Thomas McKean and General William Irvine served for Pennsylvania, and United States Attorney General William Bradford, Senator James Ross, and Pennsylvania Supreme Court Justice Jasper Yeats served for the federal government. All five of these Pennsylvanians attended mass meetings at Parkinson's Ferry and Redstone Old Fort, and met with Bradford and other rebel leaders. When they reported back that there was no hope of settlement, Washington prepared a military invasion. When the federal troops reached Parkinson's Ferry on November 8, they found no signs of insurgency or rebellion. They did, however, round up several hundred suspects, arrested twenty of the ringleaders, and marched them back to Philadelphia for trial. Bradford, however, eluded capture by escaping south to Spanish West Florida (present-day Louisiana). 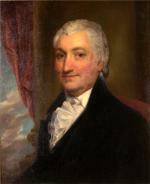 In 1799, Washington would grant Bradford a presidential pardon. Preferring to remain on his plantation in Spain's Louisiana territory, the rebel leader never returned to the United States. As one might expect, early historians of the rebellion had little good to say about David Bradford. (His fellow attorneys in Washington County would complain about his emotional instability when they told their stories to the chroniclers.) Bradford did, however, leave behind his own eight-page account of the rebellion - never published - that he dictated to officials in Spanish Louisiana in January, 1795. Perhaps to tell his hosts what they wanted to hear - that there was a real possibility Spain could take over the western parts of the United States - he claimed that the meeting at Braddock's Field declared for independence, and that only under coercion did a populace nearly universally against the whiskey tax submit to federal authority. He asserted that the people in western Pennsylvania and beyond had declared the tax "annulled," and formed "councils of their neighbors and their members published in the Pittsburgh Gazette recommending to the public officials that they abstain from respecting as members of society the officials for collecting the excise tax, considering them as contemptible men, thinking by that method that no one would receive a similar official." After the rather leaderless attack on the Neville House at Bower Hill and the death of insurgent John McFarland, Bradford stated that "the general opinion was that they should support those who attacked the Neville house and not let them be persecuted [note, not prosecuted] by the law." He also insisted that if the commission sent by Washington to negotiate with the rebels had not "spread inflammatory rumors" the people, who had agreed to lay down their weapons, would not have been subject to invasion by the federal army. In 1959, the Pennsylvania Historical and Museum Commission assumed control of the Bradford House and supervised the restoration of its eighteenth-century design. Since1972 it has been managed by the Bradford House Historical Association. Thomas P. Slaughter, The Whiskey Rebellion: Frontier Epilogue to the American Revolution (New York: Oxford University Press), 1986.